Water. Earth. Fire. Metal. Wood. This isn’t Nickelodeon’s newest revamp of the Avatar series: these are the five elements of the Taoist teachings, and the building blocks of New Star Games’ recent strategy game, Five Elements. According to their website, one of the goals of New Star Games is to “dare to create something really new.” And create something really new they have. 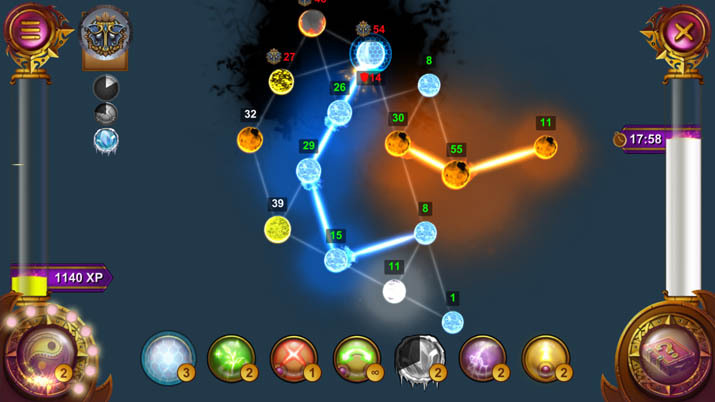 Five Elements is a real-time strategy game that twists the player’s brain into knots with puzzles that force the player to utilize lateral thinking in order to achieve the game’s ultimate goal: immortality. The premise is more or less based on the practice of Taoism, with an atmosphere of general mysticism and magic. The entirety of the gameplay is done inside the character’s mind, supposedly imitating a deep meditative state. In this state, colorful nodes appear that represent one of the five elements. Each reacts with another in a different way, like an ancient-eastern philosophy edition of rock, paper, scissors. The different possible reactions are: Creation, where one element uses its energy to create more of another; Destruction, where it uses its energy to destroy another; Devourment, where it destroys another single element while creating more of its own type; or Waste, where it expands its energy to no avail. It’s a lot to unpack, but Five Elements makes it so that the player doesn’t have to remember every single combination of every element. Not only does it show how each element will react with another before making a move, there’s also a schematics page that can be visited at any time during a paused game. 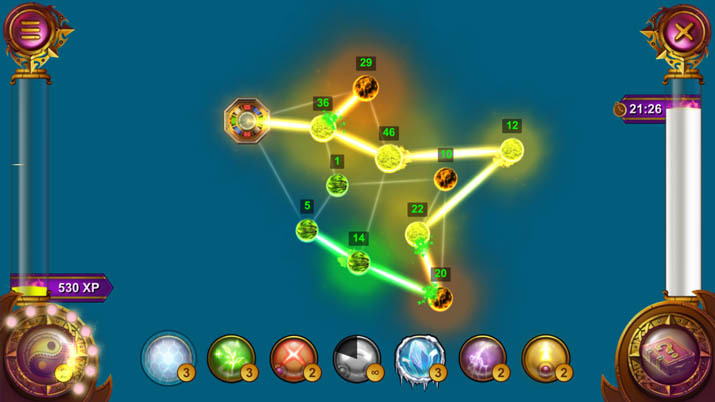 Each level is won by using the positive nodes to take over neutral and hostile nodes through using the power of their respective elements. But all of that changed when the Fire Nation- ahem, I mean, “sins” attacked. While overtaking negative and neutral nodes is a challenge on its own, the real game starts when the player encounters the villains of the game: the sins. Some nodes on a level will be clouded in black smog with an intricate kabuki mask hovering over it. These kabuki masks represent different sins who infest the character’s mind and hinder the journey to immortality. The nodes still are of a certain element, and react in their prescribed ways, but each sin has their own super ability as well. “Laziness,” for instance, will stay in the same spot, while “Hatred” will periodically set fire to all of the surrounding nodes. As an added challenge, levels must be completed before the character’s “willpower” runs out, meaning they’re timed challenges. While the digitally-rendered illustrations are beautiful, the animations in Five Elements are either very simple or nonexistent. And because the entirety of the game is set inside the character’s mind, the environment and surroundings can start to seem a little stale. Additionally, the only narrative that exists is one presented at the beginning of the game, in the form of two digital paintings. The first painting is a warrior in traditional samurai garb asking a Daoshi (a Taoist priest) the secret to immortality. The second is the same warrior, but out of his armor and ready to meditate away all of the bad thoughts. Back to the meat of the game, the music fits well with the ambience Five Elements constructs. The score is almost completely comprised of the beautiful plucks and twangs of a Guzheng (Chinese zither), which only adds to the Eastern Asian-style meditation aesthetic. However, nothing really stands out about the melodies. It feels like music that I’ve heard a hundred times in Kung Fu movies, usually during a dramatic shot of the hero with the sun at his back. Five Elements is an original, challenging, and solid real-time strategy game. Apart from those accolades, though, there’s not much else that wows the player. If you are a lover of strategy and puzzles for the sake of strategy and puzzles, this game isn’t one to miss. If you’re not already a fan of the genre or require a little more story and soul, Five Elements may prove to be frustratingly challenging without enough of a storyline to keep you going. On a side note, the developers would probably have a lot of success in converting Five Elements to a mobile platform, where a congruent storyline is less expected than solid puzzle gameplay. I can tell you this right now; I would wear out the pads of my fingers playing this on my phone while using public transportation.